Wolf Commercial Real Estate, the foremost Southern New Jersey commercial real estate broker that specializes in South Jersey commercial real estate listings and services, now has available South Jersey industrial space for lease at 460 Veterans Drive Burlington NJ. This well-located Southern New Jersey industrial space for lease is part of office/warehouse space for lease at 460 Veterans Drive Burlington NJ. There is approximately 1,996 to 17,238 square feet of divisible South Jersey warehouse space for lease at this industrial space in South Jersey. The asking lease price for this flex space in Burlington is $8.00 – $9.00/sf NNN. This South Jersey industrial building for lease is now available for immediate occupancy from Wolf Commercial Real Estate, a Southern New Jersey commercial real estate brokerage firm with expertise in South Jersey commercial real estate listings and services. This flex space in Burlington has been zoned for light industrial, R&D and office uses, making this South Jersey industrial space for lease ideal for a variety of industrial, warehouse and flex uses. This Southern New Jersey industrial space for lease at 460 Veterans Drive Burlington NJ features 18-foot-high ceilings. This South Jersey flex space for lease also has column spacing set at 40 feet by 40 feet. This Burlington industrial space for lease is a fully heated and air conditioned facility. A Rooftop Solar System has been installed at this South Jersey warehouse space for lease. This system provides a “green” source of electric at lower costs for this South Jersey industrial building for lease. This flex space in Burlington also is connected to the main electric grid for redundancy purposes. There are three interior tailgate doors at the loading docks at this Southern New Jersey industrial space for lease. Drive-ins are available at this Burlington industrial space for lease and will be installed to the tenant’s specifications. This South Jersey flex space for lease at 460 Veterans Drive Burlington NJ is conveniently located in close proximity to some of the area’s major roadways, as well as to mass transit. This South Jersey industrial building for lease is easily accessible from the Burlington Bristol Bridge and I-95. A NJ Transit River Line Light Rail station is located on the property at this industrial space in South Jersey. This South Jersey warehouse space for lease is available through Wolf Commercial Real Estate, a Southern New Jersey commercial real estate broker with expertise in South Jersey commercial real estate listings and services. 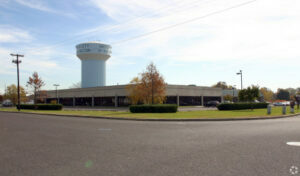 Parking is plentiful at this South Jersey flex space for lease at a ratio of 3.0/1,000 sf. Both monument and tenant suite signage is available at this Burlington industrial space for lease. More than 177,500 people reside within five miles of this New Jersey industrial space for lease and the average household income in the same area of this industrial space in South Jersey is $76,830. For more information about this South Jersey industrial space for lease at 460 Veterans Drive Burlington NJ or about any other South Jersey commercial properties for sale or lease, please contact Leor Hemo (856-857-6302; leor.hemo@wolfcre.com) or Jason Wolf (856-857-6301; jason.wolf@wolfcre.com) at Wolf Commercial Real Estate, a Southern New Jersey commercial real estate brokerage firm r that specializes in South Jersey commercial real estate listings and services. Wolf Commercial Real Estate is a premier Southern New Jersey commercial real estate broker that provides a full range of South Jersey commercial real estate listings and services, marketing commercial offices, medical properties, industrial properties, land properties, retail buildings and other South Jersey commercial properties for buyers, tenants, investors and sellers. Please visit our websites for a full listing of South Jersey commercial properties for lease or sale through our Southern New Jersey commercial real estate brokerage firm.